HEST10-8E-2G-VLW series switches are designed for communications between machines/devices inside trains. This line of switches are equipped with intelligent PoE/PoE+ power supply capability, thus provide the flexibility of adding machines/devices without having to worry about power sources. 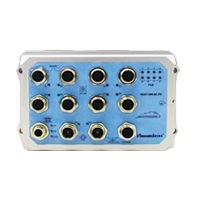 Compliant with IEC61375, EN51055 and EN50121 standards, and working under extreme temperatures (-40°C to +75°C), these highly compactly- designed industrial switches can meet any hazardous environments while providing robust communication performance for critical applications such as train traction and/or braking command requirements through these reliable devices. Support 8 x 10/100BaseT(X) M12 Ethernet ports with PoE/PoE+ functions, and 2 Gigabit M12 Copper ports, dual-powered input 72-160VDC, with each port up to 30 watt and total 135 watt for 8 PoE ports. The PoE/PoE+ functions can also be managed intelligently to provide more flexible and controlled power functions. This line of switches provide a full set of network data management functions such as redundancy recovery, VLAN, QoS, IGMP, Trunking, SNMP, etc., in addition to the hardened M12 connector and IP67 enclosure protection.